Computerized identification of early ischemic changes in acute stroke in noncontrast CT using deep learning, (Noriyuki Takahashi, Yuki Shinohara, Toshibumi Kinoshita, Tomomi Ohmura, Keisuke Matsubara, Yongbum Lee, Hideto Toyoshima), Proc of SPIE Medical Imaging, vol.10950, pp.109503A:1-6, San diego, USA, 13 March, 2019. 乳児股関節の超音波画像診断支援システムの開発，(李鎔範)，小児内科, vol.51, no.1, pp.58-62, Jan. 2019. 脊椎形状情報に基づく整然と死後のCT画像における個人同定の試み，(李鎔範，谷川峻，長谷川晃，高橋直也)，電子情報通信学会技術研究報告, MI2018-19, pp.87-88, May 2018. ウェブカメラを利用した放射線治療用の非接触型呼吸モニタリング法の開発，(李鎔範，早川岳英，笹本龍太，笠原敏文)，電子情報通信学会技術研究報告, vol.116, no.393, MI2016-96, pp.97-100, 2017. 発育成股関節形成不全の自動評価のための超音波画像解析法の基礎的検討，(李鎔範，長谷川晃，皆川靖子，弦巻正樹，伊賀敏朗)，電子情報通信学会技術研究報告, vol.116, no.393, MI2016-96, pp.93-96, 2017. Usefulness of a z-score-based semi-quantitative analysis of the temporal horn volume of the lateral ventricle for detection of early Alzheimer’s disease on CT images, (N. Takahashi, T. Kinoshita, T. Ohmura, Y. Lee, E. Matsuyama, H. Toyoshima), International Journal of Computer Assisted Radiology and Surgery, vol.11, Supplement 1, pp.s274-275, Heidelberg, Germany, June 21-25, 2016. Measurement of pupil size during mammography, (Yongbum Lee, Mieko Uchiyama, Tomoko Sumiyoshi, Takeshi Hara), Proc. of XXI IMEKO World Congress, TC13, pp.1333-1336, Prague, Czech Republic, Aug. 30 - Sept. 4, 2015. Assessment of pain during mammography by a device for quantitative analysis of perception and pain, (Mieko Uchiyama, Yongbum Lee), Proc. of XXI IMEKO World Congress, TC13, pp.1377-1380, Prague, Czech Republic, Aug. 30 - Sept. 4, 2015. 核医学画像におけるエッジ法による空間分解能測定への応用, (山崎芳裕, 蔡篤儀, 李鎔範, 三浦環), 日本放射線技師教育学会論文誌, vol.6, no.1, pp.7-12, March 2014. Evaluation of Physical and Psychological Burden of Subjects in Mammography, (Yongbum Lee, Mieko Uchiyama), IWDM 2014, LNCS 8539, pp.508–513, 2014. ヒトの視覚特性を考慮したフラクタル次元による胸部X線画像の評価，(遠藤駿，李鎔範，蔡篤儀，原武史)，電子情報通信学会 技術研究報告, vol.113, no.410, MI2013-119, pp.331-334, 2014年1月. 不鋭を含む医用X線画像の自動認識法，(室井僚哉，李鎔範，蔡篤儀，弦巻正樹)，電子情報通信学会 技術研究報告, vol.113, no.410, MI2013-101, pp.245-248, 2014年1月. Comparison of a discrete wavelet transform method and a modified undecimated discrete wavelet transform method for denoising of mammograms, (Eri Matsuyama, Du-Yih Tsai, Yongbum Lee, Noriyuki Takahashi), Proc. of 34th Annual International Conference of the IEEE EMBS, pp.3403-3406, Osaka, Japan, 3-7 July, 2013. Efficacy of a combined wavelet shrinkage method for low-dose and high-quality digital radiography, (Haruyuki Watanabe, Du-Yih Tsai, Yongbum Lee, Eri Matsuyama, Katsuyuki Kojima), IFMBE proceedings (Proc. of World Congress on Medical Physics and Biomedical Engineering), vol.39, pp.888-891, Beijing, China, May 26-31, 2012. A method mammographic image denoising based on hierarchical correlations of the coefficients of wavelet transforms, (Eri Matsuyama, Du-Yih Tsai, Yongbum Lee, Haruyuki Watanabe, Katsuyuki Kojima), IFMBE proceedings (Proc. of World Congress on Medical Physics and Biomedical Engineering), vol.39, pp.872-875, Beijing, China, May 26-31, 2012. Quantitative images quality evaluation of digital medical imaging systems using mutual information, (Du-Yih Tsai, Eri Matsuyama, Yongbum Lee), Proc. of 2011 4th International Conference on Medical Engineering and Informatics, vol.3, pp.1528-1532, October 2011. ウェーブレット変換で強調した乳房X線画像に対する二点嗜好法による視覚評価, (李鎔範, 蔡篤儀), 新潟大学医学部保健学科紀要, vol.10, no.1, pp.29-36, 2011. コンピュータ支援診断システムの新しい応用，（李鎔範，蔡篤儀），新潟大学医学部保健学科紀要, vol.9, no.3, pp.35-41, 2010. Computer-Assisted Scheme for Automated Determination of Imaging Planes in Cervical Spinal Cord MRI, (Masaki Tsurumaki, Du-Yih Tsai, Yongbum Lee, Masaru Sekiya and Kiyoko Kazama), Proc. of SPIE Medical Imaging 2009, vol.7259, no.72593W, pp.1-8, 2009. Resolution and Noise Trade-Off Analysis for Digital Radiography Using Mutual-Information Metric, (Eri Matuyama, Du-Yih Tsai, Yongbum Lee and Katsuyuki Kojima), IEICE Technical Report(MI2008-145, Proc. of International Fourm on Medical Imageing in Asia [IFMIA2009]), vol.108, no.385, pp.391-396, Jan. 2009. An Algorithm for Automated Determination of Sagittal Imaging Plane from Positioning Images in Cervical Spinal Cord MRI, (Masaki Tsurumaki, Du-Yih Tsai, Yongbum Lee, Masaru Sekiya and Kiyoko Kazama), IEICE Technical Report(MI2008-172, Proc. of International Fourm on Medical Imageing in Asia [IFMIA2009]), vol.108, no.385, pp.507-512, Jan. 2009. Evaluation of Irreversible Compressed Images Using Physical Image Quality Measures, (Haruyuki Watanabe, Du-Yih Tsai, Yongbum Lee, and Tomohiro Nakamura), IEICE Technical Report(MI2008-183, Proc. of International Fourm on Medical Imageing in Asia [IFMIA2009]), vol.108, no.385, pp.559-564, Jan. 2009. 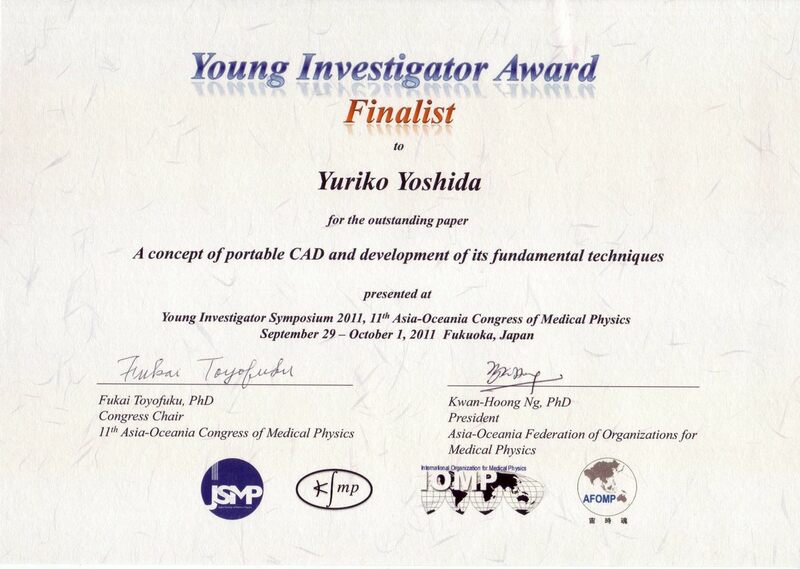 Evaluation of Physical Properties of Medical Imaging Systems Using a Metric of Transmitted Information，(Eri Matsuyama, Du-Yih Tsai, Yongbum Lee, and Masaru Sekiya)，Bull. Sch. Health Sci. Niigata Univ.，vol.9，no.1，pp. 57-62, 2008. Intelligent Computer-Aided Diagnosis Based on Normal Structure Recognition of Human Body, (Hiroshi Fujita, Takeshi Hara, Xiangrong Zhou, Takuji Kiryu, Masayuki Kanematsu, Toshio Goto, Hiraoka Hoshi, Yongbum Lee, Du-Yih Tsai, Daisuke Fukuoka, Yuji Hatanaka, Tomoko Matsubara, and Tokiko Endo), Proc. of the First International Symposium on Intelligent Assistance in Diagnosis of Multi-Dimensional Medical Images, pp. 42-45, 2005. A Method of Medical Image Enhancement Using Wavelet-Coefficient Mapping Functions, (Du-Yih Tsai and Yongbum Lee), Proc. of IEEE 2003 International Conference on Neural Networks and Signal Processing, vol.2, pp. 1091-1094, 2003. An Integrated Fuzzy-GA-Based CAD System for Disease Discriminations, (Du-Yih Tsai, Yongbum Lee, Masaru Sekiya, Masaki Ohkubo, Katsuyuki Kojima, and Isao Yamada), Proc. of the First IASTED International Conference on Biomedical Engineering (BioMED2003), pp. 166-171, 2003. Digital Chest Image Enhancement Using Wavelet-Coefficient Mapping Functions, (Du-Yih Tsai Yongbum Lee, Masaru Sekiya, and Katsuyuki Kojima), Proc. of the Second IASTED International Conference on Visualization, Imaging, and Imaging Processing, pp. 324-329, 2002. Computerized Classification of Clustered Microcalcifications on Mammograms, (Yongbum Lee, Du-Yih Tsai and Masaru Sekiya), Proc. of the Second IASTED International Conference on Visualization, Imaging, and Imaging Processing, pp. 406-411, 2002. A Method of Medical Image Enhancement Using Wavelet Analysis, (Du-Yih Tsai, Yongbum Lee, Masaru Sekiya, Satoshi. Sakaguchi, and Isao Yamada), Proc. of ICSP'02 Sixth International Conference on Signal Processing, vol.1, pp. 723-726, 2002. Fuzzy-Reasoning-Based Diagnosis Scheme for Automated Classification of Heart Disease from Ultrasonic Images (Du-Yih Tsai and Yongbum Lee), Proc. of the 10th IEEE International Conference on Fuzzy Systems, vol.1, pp.178-181, 2001. A Morphology-based Method for Automated Detection of Clustered Microcalcifications, (Du-Yih Tsai, Masaru Sekiya, Yongbum Lee, Yoshihiro Yamazaki, Masaki Ohkubo, Katsuyuki Kojima and Isao Yamada), Proc. of IASTED International Conference Signal Processing, Pattern Recognition, and Applications (SPPRA2001), pp.159-162, 2001. Pattern recognition for chest CAD system, (Takeshi Hara, Hiroshi Fujita, Seiji Goto, Yongbum Lee, Hitoshi Yoshimura and Jing Xu), Proc. 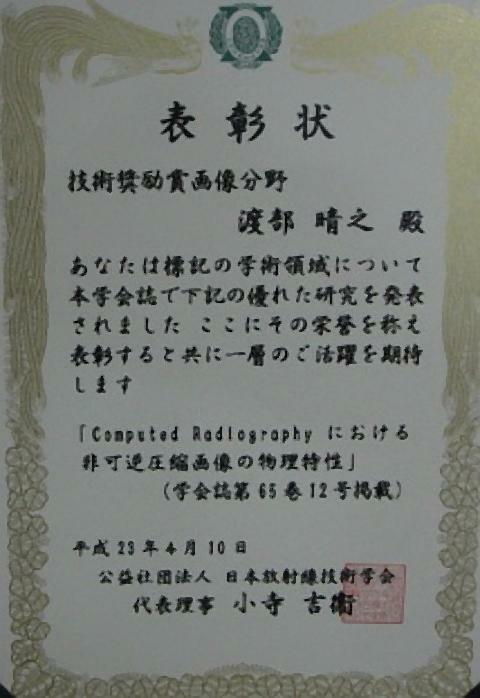 of the First International Workshop on Computer-Aided Diagnosis, pp.57-61, 1998. 数値計算のためのGNU Scientific Libraryの紹介．（李鎔範），画像通信（日本放射線技術学会画像分科会），vol.35, no.2, pp.66-70, 2012. コンピュータ支援診断(CAD)セミナー 中級編の内容紹介．（李鎔範），画像通信（日本放射線技術学会画像分科会），vol.35, no.1, pp.82-87, 2012. 新潟大学医学部保健学科 佐井・李研究室の紹介，（李鎔範），画像通信（日本放射線技術学会画像分科会），vol.30, no.2, pp.68-69, 2007.